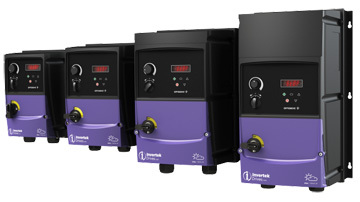 Scattergood & Johnson are pleased to introduce the latest high-quality product from Invertek Drives, a leading UK manufacturer of robust and reliable inverter drives. The IP66 / NEMA 4X Outdoor Rated Enclosed Drive, available up to 22kW. Until now, the only Invertek IP66 Enclosed Drive available was rated for indoor usage creating a limitation for end users. The new Drive from Invertek allows complete use outdoors from -20ºC to + 50ºC and with total resistance to UV exposure and suitable for use in humidity up to 90%. Available in 4 frame sizes from 0.37kW to 22kW, these multi-function general purpose drives come fully equipped out of the box for the majority of customer requirements such as constant or variable torque applications. Machine Mountable - no additional cabinet protection required. Detailed technical specifications can be found here: View Datasheet. These high-quality inverter drives are now available from Stock up to 7.5kW, with all sizes coming soon. Please contact us if you would like to discuss your technical requirements or to arrange for a demonstration.